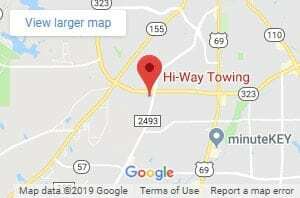 Hi-Way Towing works with several national auto clubs, dealerships, and local shops to provide roadside assistance to their customers in Tyler, TX and the surrounding areas. Whether you need a tow, jump start, locksmith, flat tire changed, or if you’ve run out of gas, give us a call and we’ll see what we can do to help you out! In many cases we can even help you get reimbursed for your towing or roadside assistance by your vehicle insurance provider by providing the required documentation to make the process go by smoothly. Great service and quick to respond. Called when my car would not start in 98 degree heat and they were there withing 20 minutes with a cold bottle of water! Highly recommend them. I was broke down in a turn lane at the intersection of Front & Glenwood today due to a bad alternator. I called these guys and they sent someone out right away. The tow was done quickly & professionally! Great job! Very friendly gentlemen, showed up sooner than expected, and got everything loaded and delivered quickly and professionally. Would recommend! !